Product prices and availability are accurate as of 2019-04-11 02:36:57 UTC and are subject to change. Any price and availability information displayed on http://www.amazon.com/ at the time of purchase will apply to the purchase of this product. Fuller flavor for better coffee and tea. Healthier Water for Tastier Food when cooking. And most importantly, it's great for the ENTIRE FAMILY!! The pitcher has a LED timer to track the life span of the filter cartridge and a calendar to remind you when it needs replacing. 2, Do not use hot water, above 100.4 ? (38 ? ),as this will taste of the water affect the use of results. FEATURES: Large capacity Pitcher, 10 cup pitcher with 2 filters. Filling capacity 3.5L total and 2.0L filtered. Memory lid tracks when to change filter Approx. 4 weeks. 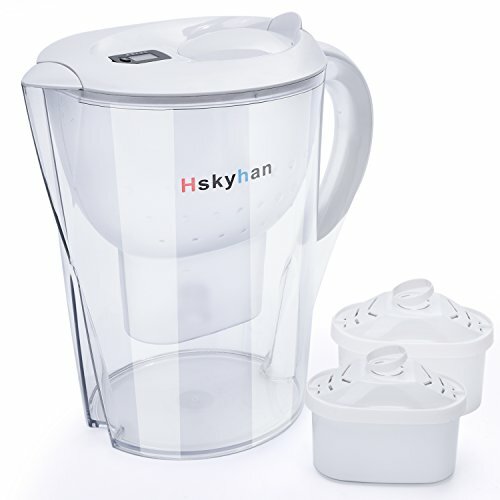 Hskyhan water filter have passed NSF&SGS certification. Using AS food grade materials, without BPA. FUNCTIONS: 5 layers of filtration to make the water weak in alkaline. Depending on the source of the water, the PH is usually increased by 0.5 to 2 or more. Can effectively filter the water of fluoride, chlorine, lead, bacteria, dirt, harmful metals and other substances in the water, remove the odor, to provide clean and healthy drinking water. WATER FILTRATION: Filtered PH from 7-10 depending on your faucet water. Our high quality filter comes with 2 easy to install filters to ultimate hygiene, clean water. Ion exchange resin, PP meltblown fiber. Fast water flow with no clogging.1 filter,300 16oz plastic bottles. DESIGN: Simple, elegant oval shape design that fits easily into most refrigerators. Ergonomic handle for comfortable pouring during use. Easy to assemble/disassemble. Pitcher gives you huge savings over buying bottled water. GUARANTEE:Beautifully packed, making it ideal as a gift for friends or family. 100% product testing. If you are not satisfied with your purchase contact us 24 hours a day for help and assistance.